We made your 'kite for kids' today out of a plastic bag. Attached is a photo of my 6 year old flying it. He has never flown a kite before. That's a fine high-visibility version of the Tiny Tots Diamond design he's flying there! On light enough line (less than 20 pound breaking strain), this little kite will happily fly at around 100 feet off the ground too. Join in and write your own page! It's easy to do. How? 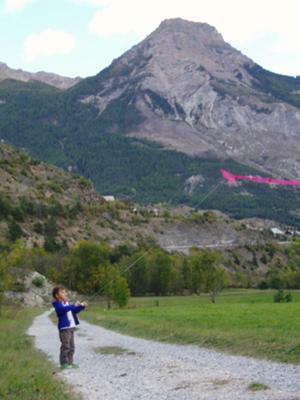 Simply click here to return to Tiny Tots Kite Builder.